Turtles (Testudines) are an ancient group of reptiles that includes more than 293 species. Turtles inhabit marine, freshwater and terrestrial habitats throughout the temperate and tropical regions of the world. Turtles have a unique anatomy. They are best known for the hard shell (also called a carapace), which is a modification of the ribcage and vertebral column. The shell is entirely internal and is part of the turtle's skeleton. The shell is composed of two layers, an outer layer of thin plates called scutes and an inner layer of bone. The underside of the turtle's shell, the plastron, protects its belly. Turtles do not have teeth, instead they possess a sharp beak that enables them to tear their food. Several common names are used to describe the various groups of turtles. These common names include tortoises (which refers to terrestrial turtles), terrapins (which refers to freshwater turtles) and turtles (which refers to any member of the Testudines). Formerly, the term turtles was used to refer only to marine turtles but now it has taken on more general usage. Many turtles are herbivores and feed primarily on plant matter. Since they are slow movers, turtles lack the ability to actively pursue prey. So a few aquatic species have developed an ambushing technique and instead wait for unsuspecting invertebrates, fish, or other small animals to cross their path. Most marine species feed primarily on seaweed but some species also eat invertebrates such as jellyfish. Turtles are among the most endangered of all reptiles. more than 40 percent of all living turtle species are classified as vulnerable, endangered or critically endangered. The first turtles appeared more than 220 million years ago during the late Triassic Period. Since that time, turtles have changed little and it is quite possible that modern turtles closely resemble those that roamed the Earth during the time of the dinosaurs. 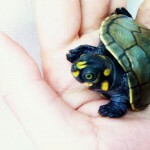 The yellow-spotted Amazon river turtle or yellow-spotted river turtle (Podocnemis unifilis) is one o..